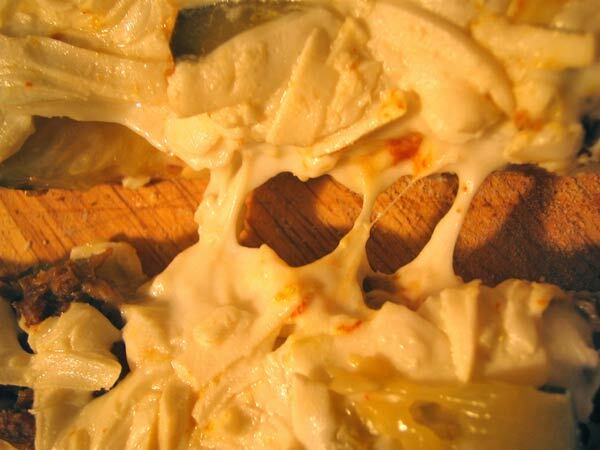 So next up, let’s use up some of that Teese Mozzarella. I’m also trying to use down some things that have been hanging out in the freezer. In this case, some Gimme Lean Sausage. So I made up a red pasta sauce which started off by frying up onion, garlic and the sausage in a saucepan, then I added a big can of crushed tomatoes, and seasoned with basil, oregano, thyme, red pepper flakes, salt and pepper. I pretty much never buy jarred pasta sauce because it’s so easy to make your own and you’re just going to doctor it anyway. 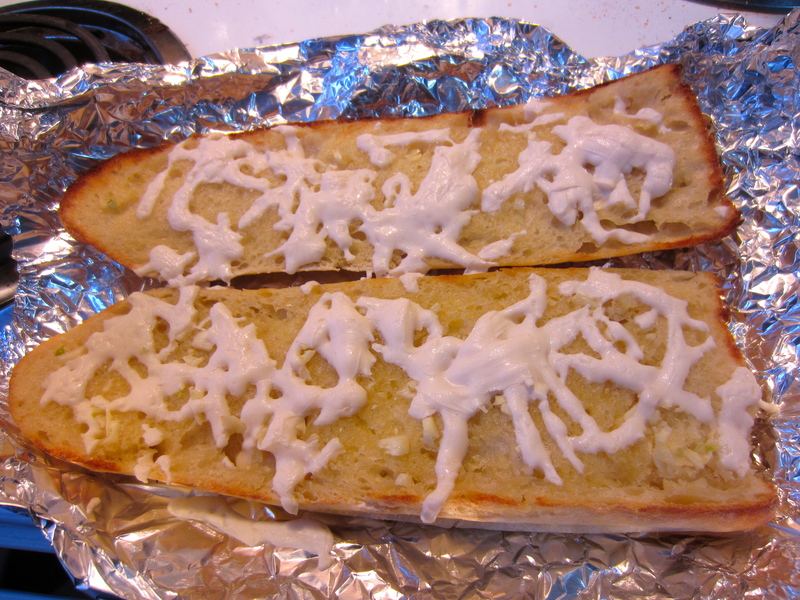 To use the Teese, I made some garlic bread. It was soaked through with garlicky Earth Balance and deliciously bad for us. At least I used whole wheat pasta. Because that will make up for all the other sins here. Like no veggies. The other half of this Teese tube went into a lasagna, but I didn’t take pictures. It included more Gimme Lean, some Twin Oaks Italian Tofu, the layer of Teese and then Daiya on top. 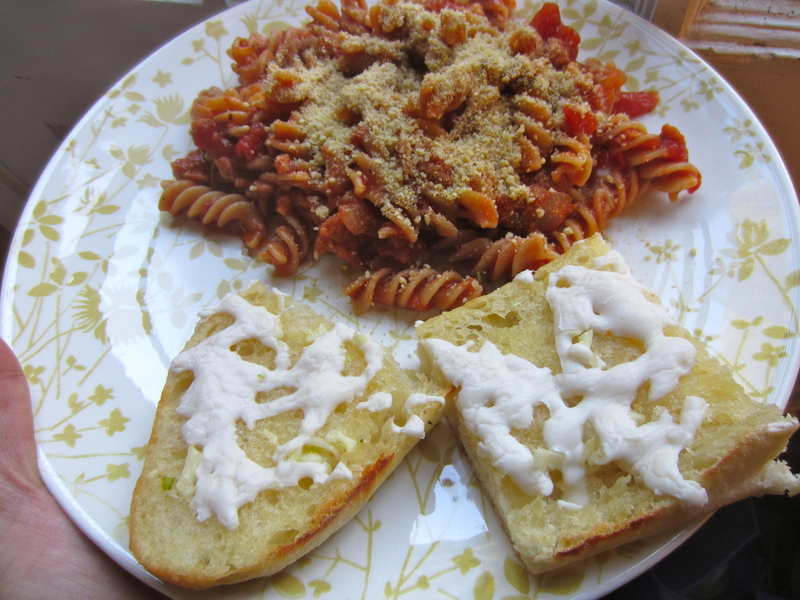 Oh, and both regular and whole wheat lasagna noodles. Can you tell I was using stuff up? With all the Daiya hype over the last couple of years, poor Teese has kind of been pushed to the side a bit. Now that Cosmo’s Vegan Shoppe is closed and Sevananda doesn’t carry it, I don’t think you can even get it in town. But recently I filled in a survey they tweeted about and was chosen to receive Teese as a thank you: the Creamy Cheddar Vegan Sauce, Mozzarella and Cheddar. 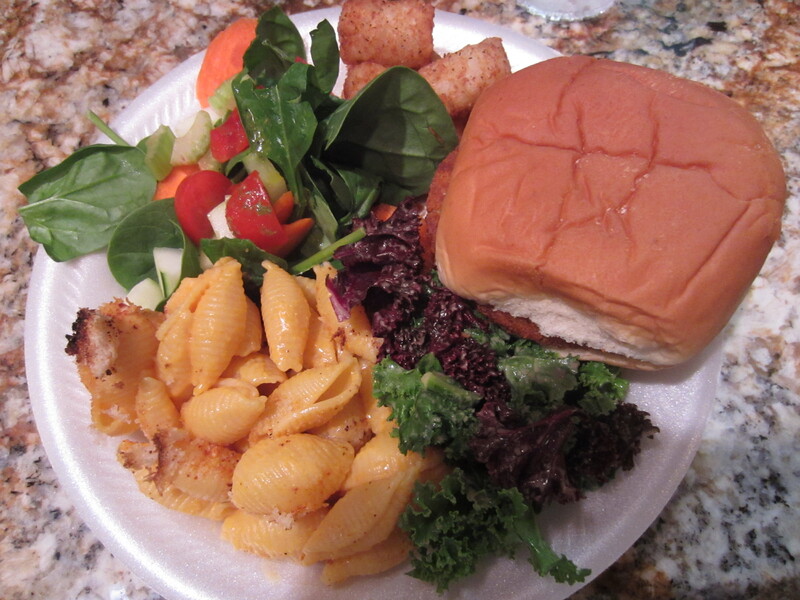 The first thing I did was make Mac & Cheeze for a potluck. 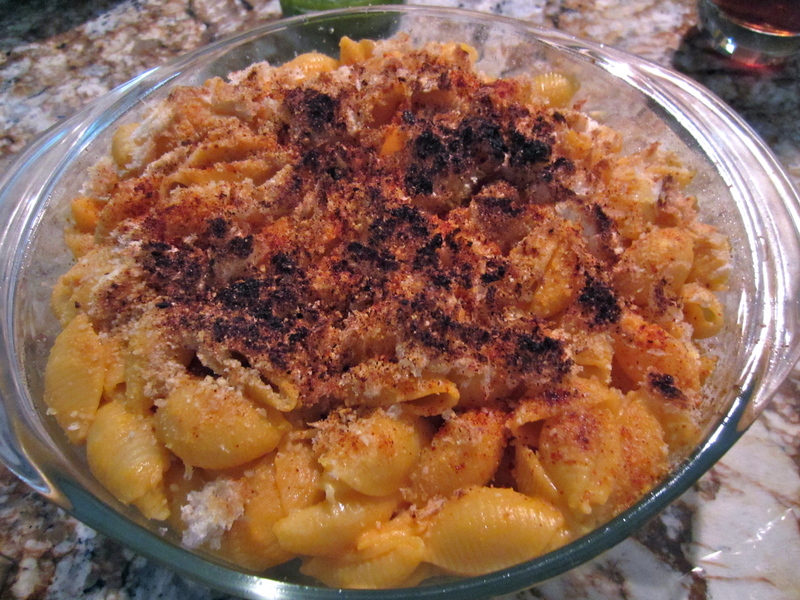 Boil up pasta, toss with a tube of Teese Cheddar Cheese Sauce, sprinkle top with bread crumbs, vegan parmesan and a little paprika, and bake until less crispy than pictured here. Normally I might mix something else in there like broccoli, but this is lazy mac & cheeze so no veggies, just straight up. Here it is hanging out with kale salad, spinach salad, tots and I think that’s a chik patty on that bun. It was a tad dry so I either overcooked it or should have used 12oz. of pasta rather than the full pound. Just a tad though. 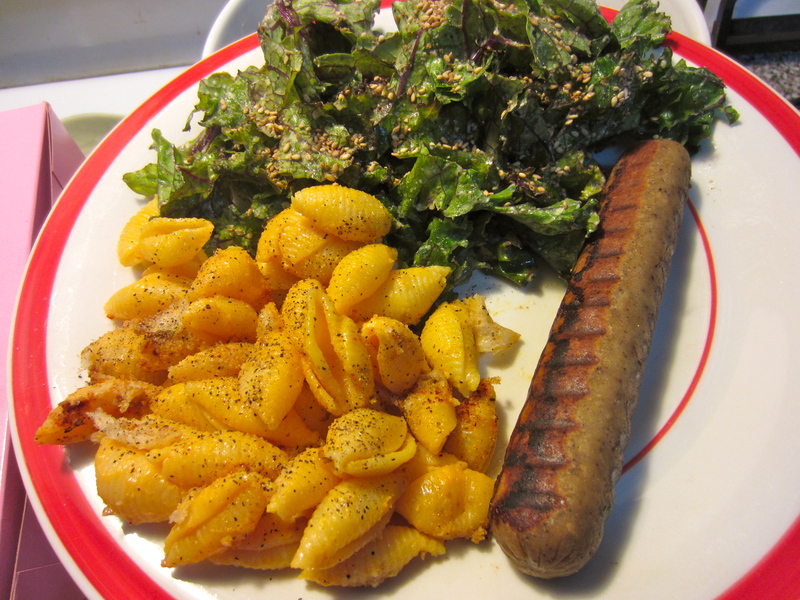 Still made awesome leftovers, here with a beer brat and kale salad. You’ve probably heard by now that the folks at Chicago Soy Dairy have reformulated their Teese vegan cheese. They were kind enough to send me a tube of the mozzarella style to try out. 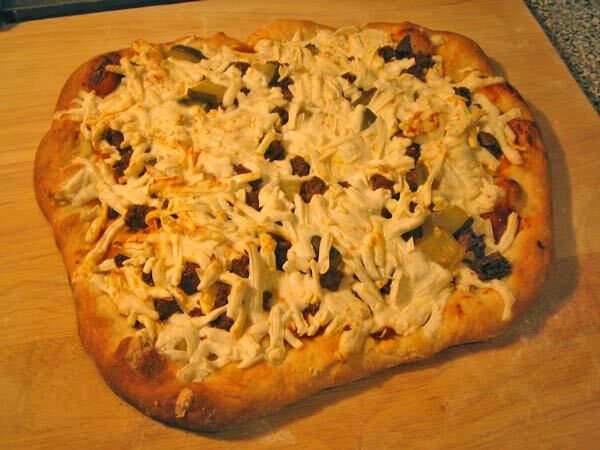 One of the best tests for a vegan cheese is pizza. So that’s what I did with it. And I pretty much dumped a whole tube of shredded Teese on this pizza. So what’s on it besides Teese? It’s a cheeseburger pizza! So it’s ketchup and mustard all over the dough as the sauce, chopped up veggie burgers and pickles. And the dough is from Trader Joe’s. The Teese does melt to a better consistency. It has the stretch thing going on and doesn’t totally liquefy like the old formula would. I’m sure it will work better for quesadillas than the old one. One complaint is that it seemed a little bland. I haven’t had the live for prime time version that is selling now so I’m not sure if that has been fixed. Still, it’s pretty awesome and I would never turn my nose up at a Teese pizza. One of the things that’s not really available around here is a good vegan breakfast sandwich. At least, not yet. But you can make your own. And it’s not all that hard, either. Especially with all the great products that are on the market now. I already had a package of Match Vegan Meats Breakfast Sausage left over from the batch they sent me to make holiday loafs. And Chicago Soy Dairy sent me some Teese to play with for their blogger challenge. So here was my plan. 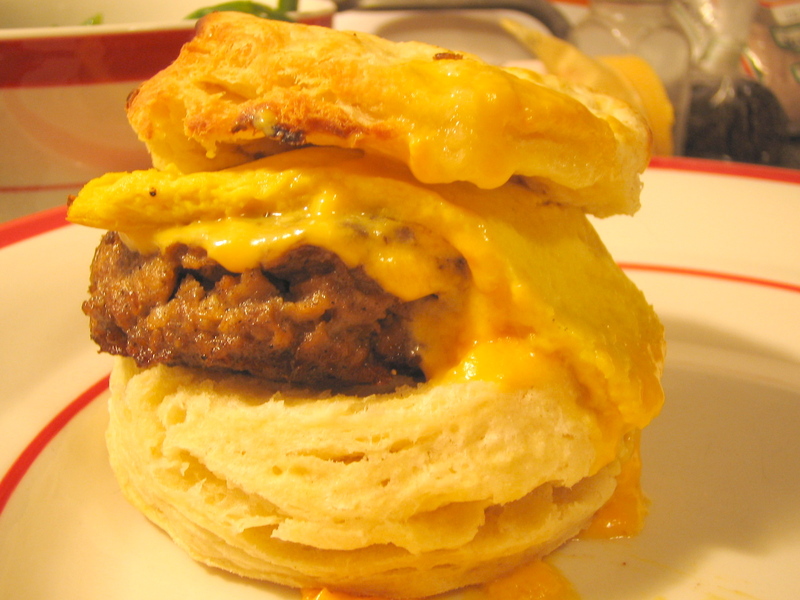 Tall fluffy biscuits. This recipe made the fluffy awesomeness you see in the photo. For the “egg”, I started with Susan’s crustless tofu quiche recipe. I omitted the bell pepper, mushrooms, chives and rosemary and replaced the fresh garlic with a 1/2 teaspoon of garlic powder since I wasn’t going to fry it up. Then, instead of baking them in a muffin pan, I spread it out in a rectangular baking pan then cut into squares to go on the muffin. The Match was just formed into patties, fried in a pan with only salt and pepper as seasoning. 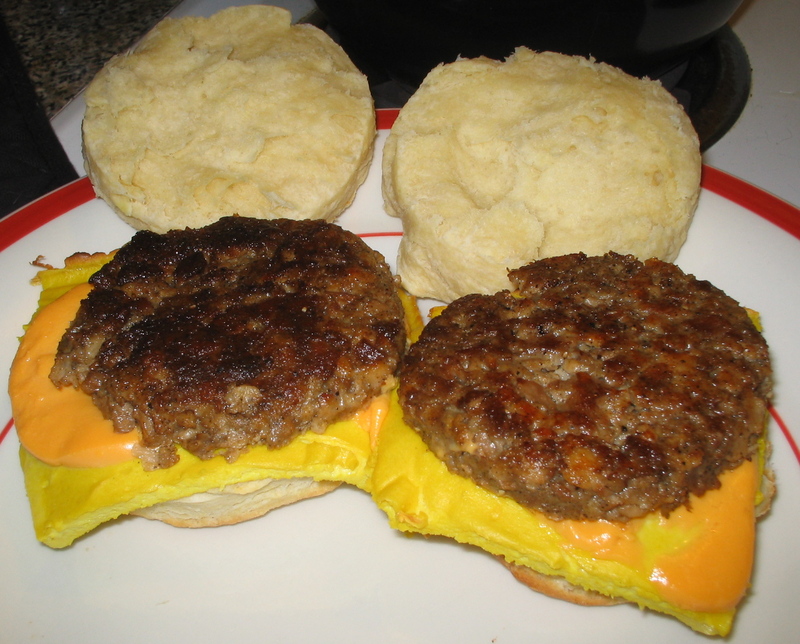 To assemble, the biscuit was split, a couple of thin slices of the Teese creamy cheddar was put on the top half and then I slid it under to broiler to melt. Sausage and tofu egg was placed on the bottom half then everything was put together once the Teese was melty. These were amazing! I do have a couple of changes I’d make though. I made 3 oz. sausage patties which were a little too much. 2 oz. might be thin enough. I’d try to make the tofu egg a little dryer. Maybe half the soy milk and cook it a little longer. And I’d probably switch to regular cheddar Teese so it would contain a little less moisture. The past couple of weeks, I haven’t had a chance to get over to Your DeKalb Farmer’s Market like I normally do every week. So I’ve been living off of freezer food, occasional Trader Joe’s or grocery store quick stops for essentials, etc. This pizza was one of those meals. I had some pesto, fakeroni and Teese in the freezer. So all I needed for pizza to happen was a crust. Trader Joe’s to the rescue! They sell dough balls in the refrigerator section for $1.19. A cheap and easy pizza solution. With all the Daiya posts lately, you would think that I’ve completely forgotten about Teese. 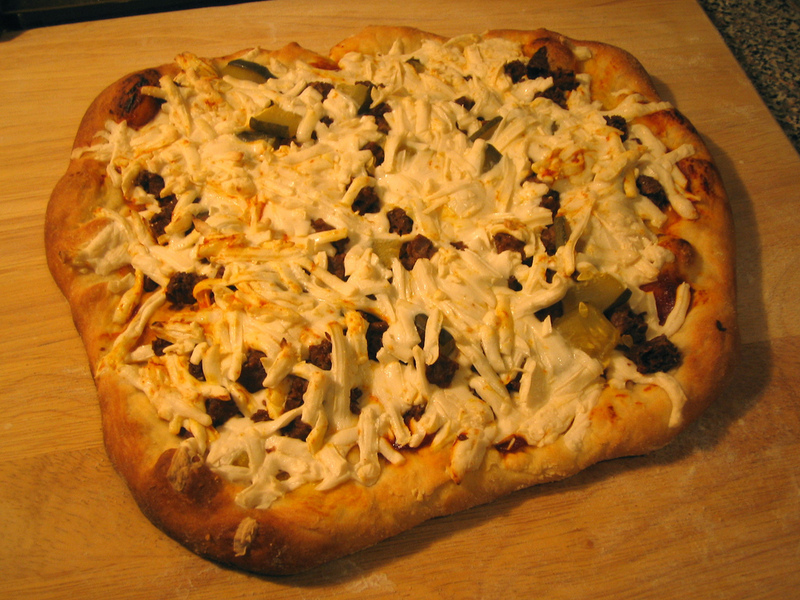 The Teese mozzarella style works really nicely on pizza. I didn’t feel like washing my grater (see, lazy), so I just sliced it thinly and then cut into sticks and scattered them over the top. They still melted up nicely.